I love garden season! Our basil has been going a bit crazy lately, so the thing to do is... of course... make homemade pesto. 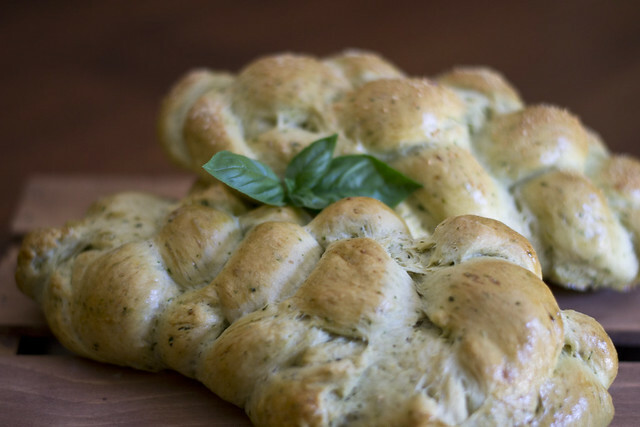 And when one has fresh pesto, the thing to do is... of course... make pesto challah! 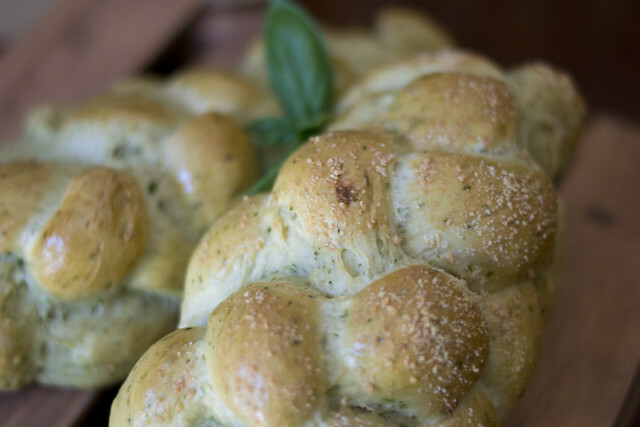 For this challah, you can use your own fresh pesto or store-purchased pesto. 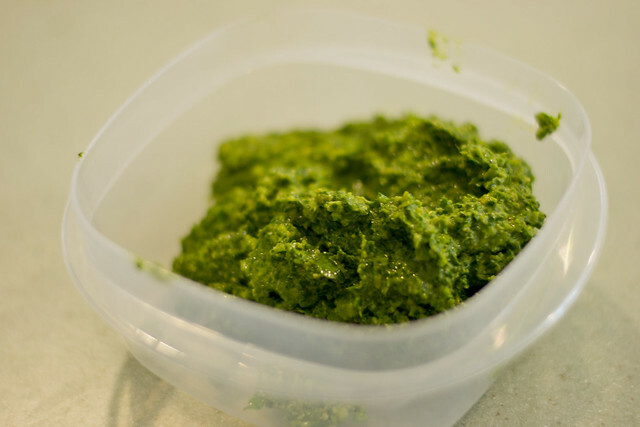 When I make pesto at home, I leave out the cheese to make it parve and then freeze it. Then I add parmesan later. 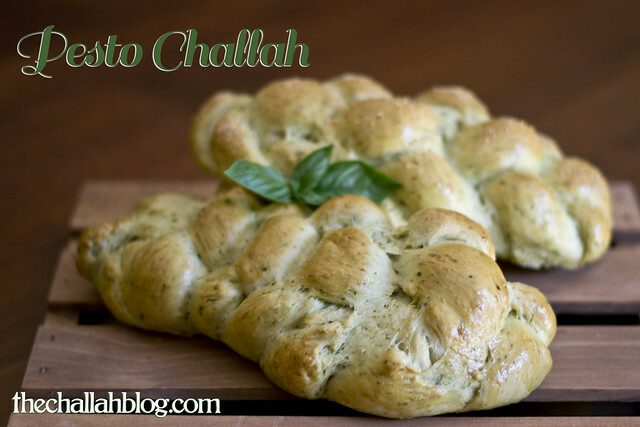 It's really up to you, but keep this in mind in case you want to serve your pesto challah with a meat meal. 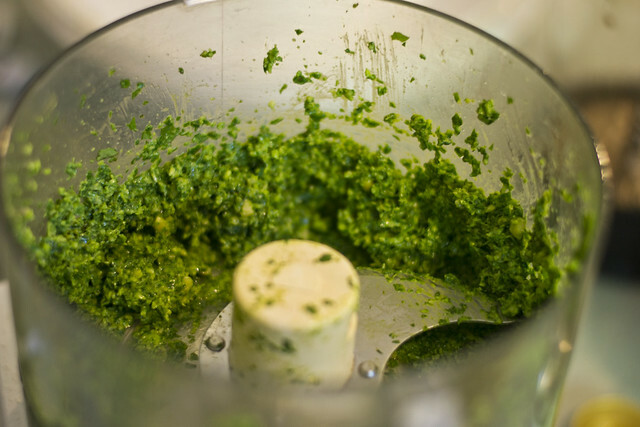 To prepare the pesto, wash the basil and place in food processor. Peel and roughly slice the garlic and add with the pine nuts. Add a pinch of salt and pulse until finely chopped. You may need to wipe down the sides of the food processor with a spatula. Through the feeder tube, add the olive oil slowly to your desired consistency. 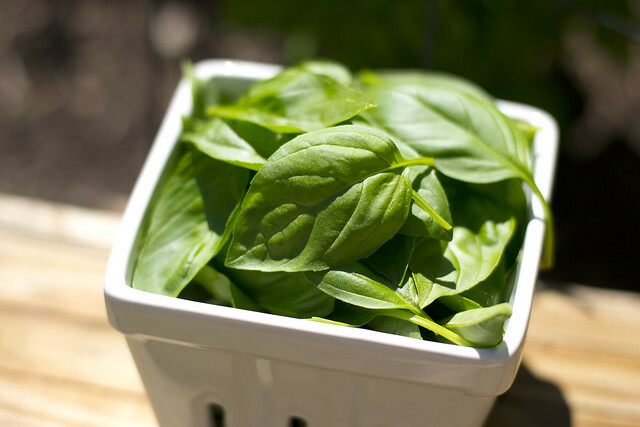 I'm always blow away that two huge handfuls of basil produce such a small amount of pesto. My yield was this little teeny tupperware full... which I divided into a mere 6 ice cubes (freezing is a great way to get just the right amount. You can freeze in ice cube trays and then pop out and put into a plastic bag). 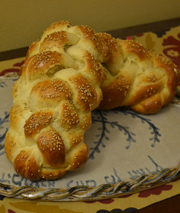 For the challah, add the yeast and sugar to warm (but not hot) water in mixing bowl. Allow yeast to proof about 10 minutes. 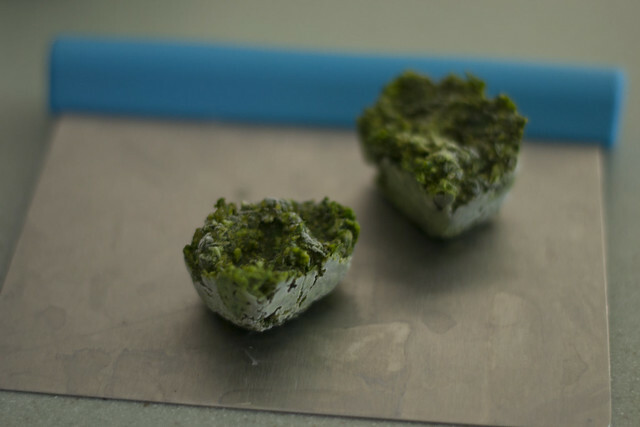 In the meantime, you can retrieve your pesto from the freezer and thaw it in the microwave if need-be. I used two ice cubes which was equivalent to about 2 tablespoons of pesto. 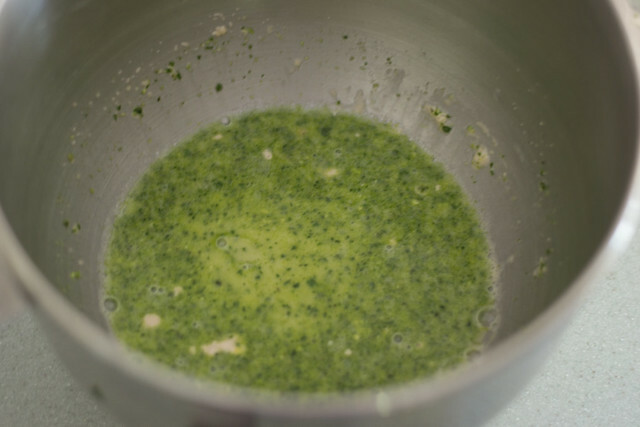 Mix the pesto into the proofed yeast. Add the egg. 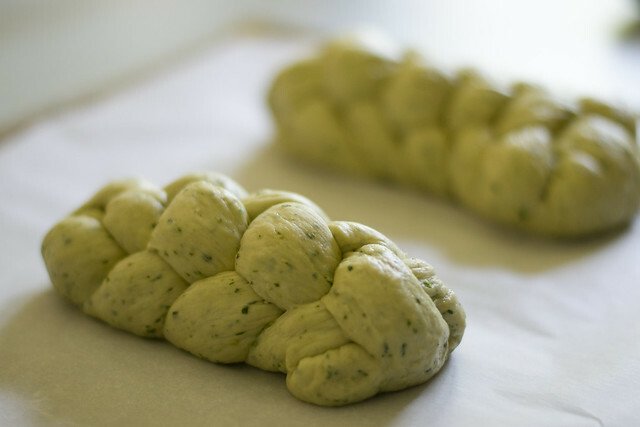 Since the pesto already has olive oil, I went easy on the amount of oil in this challah, adding just 3 tablespoons. Add the flour and salt (if using). At this point, you can also add parmesan cheese if you want to make your challah for a dairy meal. Mix by hand or on a stand mixer until a ball forms. This dough is a bit more relaxed than most of my other doughs. Place in oiled bowl and cover in plastic wrap or a towel. 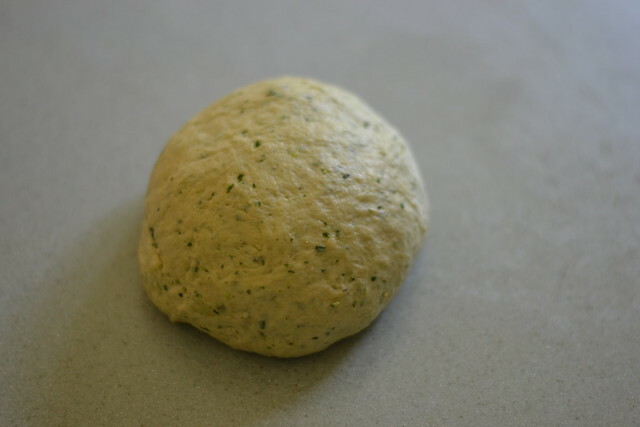 Allow to rise at about an hour and a half, until dough has doubled in size. Braid as normal. Allow to rise an additional 20-30 minutes. Top with an egg wash and parmesan cheese if you like. Bake at 350 for 25-30 minutes. 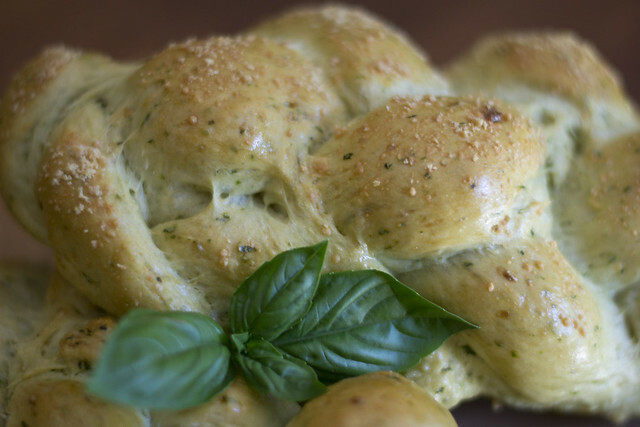 Surprisingly, the flavor of pesto challah is milder than the taste. You do get your garlicky goodness (which we luuuuurve! 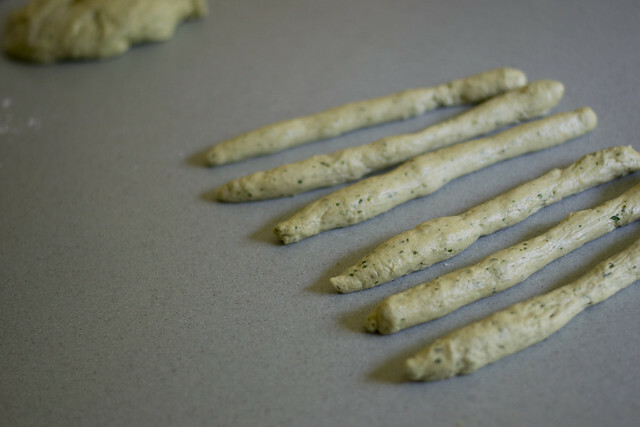 ), but you can add more or less pesto to your own taste. The result is really fun and the color of the pesto plus the additional olive oil, gives the bread a lovely shade. Have I mentioned that I LOVE garden season?